In Japanese cuisine, braised or simmered fish is considered a rustic meal with flavors that are unique to each family, but it is often served in restaurants as well. In Japanese, braised or simmered fish is sometimes referred to as nizakana, nitsuke, or sakana no nimono. The terms are often used interchangeably. Two of the most popular ways to braise fish is either with miso (fermented soybean paste) or soy sauce (shoyu), but the latter is likely more common. Depending on the home cook or chef, soy sauce braised fish will range in sweetness and flavor depending on the combination of ingredients. Often, the nitsuke style of simmering fish is used as a technique to subdue the natural flavor and aroma of stronger or fattier fish. For example, the bold flavors of the soy sauce and sweetness from the sugar and mirin act to mask any possible “fishy-ness”. An important technique to simmering or braising fish, especially when cooking with stronger flavored fish, is to gently bathe raw fish with hot water prior to cooking it. Hot boiled water is poured over raw fish, the flesh changes to a whitish-grey color, and then the fish is removed immediately. The point of this step is not to cook the fish, but to almost rinse it. This simple hot water bath helps to minimize strong fish flavors and aromas. Also important when braising or simmering foods, is to use a Japanese-style drop lid, known as an otoshibuta. It is typically made of wood, although there are some lids made of stainless steel or silicone. Its diameter is smaller than that of the simmering pot so that the lid fits inside the pot and rests directly on top of the food that is simmering, instead of covering the entire pot as a typical lid would do. Otoshibuta helps to increase the heat in the pot and cook food more evenly. It also circulates the simmering liquid more evenly, prevents the top of the food from drying out, and helps to reduce the liquid. 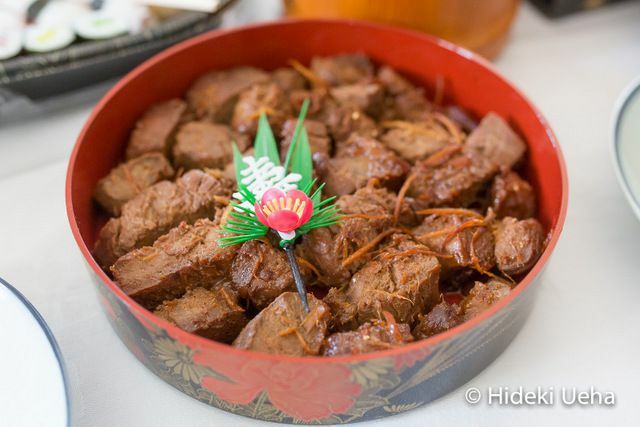 A make-shift otoshibuta may be made by cutting out a piece of aluminum foil with small holes, or simply use a lid to a smaller pot than the one used to cook this dish. Recipe Tip: Two key ingredients for this ginger soy braised tuna (maguro no nitsuke) recipe are plenty of fresh ginger, and ginger ale soda. These two ingredients add fresh and spicy ginger flavors and a sweetness that marries well with the strong savory flavors of soy sauce. Try experimenting with different flavors of soda, such as lemon-lime or cola. Place raw fish in a deep dish and pour hot boiled water over the fish. The exterior flesh becomes slightly whitish-grey. Immediately remove the fish from the hot water or drain. Next, cube fish into generous bite-sized portions. Remove exterior skin of the ginger. Grate half the ginger and slice the remainder into matchstick pieces. In a medium pot, add soy sauce, sake, mirin, sugar, ginger ale, and ginger. Bring to a boil over medium - high heat, then reduce to simmer. Add cubed fish, place drop lid (otoshibuta) over the fish, and simmer for 1 hour.